Srinagar, March 10 : Several local newspapers in Jammu and Kashmir on Sunday published blank front pages. The Kashmir Editors Guild had earlier sought the attention of the Press Council of India and the Editors Guild in this matter. 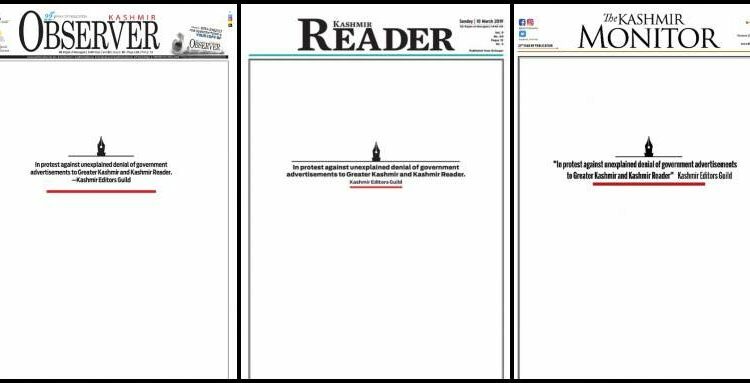 Several local newspapers in Jammu and Kashmir on Sunday published blank front pages in protest against the “unexplained denial of government advertisements to Greater Kashmir and Kashmir Reader”. Among the papers that published blank covers are the Kashmir Observer, Kashmir Reader, Kashmir Vision and The Kashmir Monitor. The Jammu and Kashmir administration stopped advertisements to the two major dailies a day after the militant attack in Pulwama on 14 February, in which over 49 CRPF men lost their lives. The Kashmir Editors’ Guild had earlier urged the Press Council of India and the Editors Guild to exercise their legal, ethical and professional mandate to intervene, News18 reported. The guild had said that the media in Kashmir is one of the most professional and has retained its neutrality even at the cost of lives. “It will continue to do so. The professional capacities of the Kashmir media have been acknowledged the world over. The Press Council of India had also issued a detailed report in 2018, detailing the issues and challenges that the Kashmir media is facing. It also addressed certain misconceptions about the media in the report. The guild also wants to reiterate that the attempts at strangulating the media is in continuation of what has happened in last more than three decades,” it said. 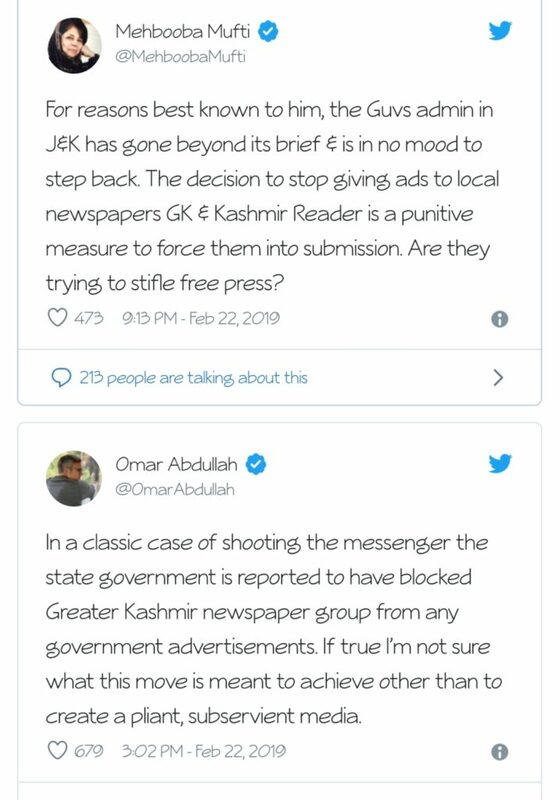 The media in Kashmiri is no stranger to making brazen statements on paper. Following the murder of Rising Kashmir editor Shujaat Bukhari on 14 June, 2018, Kashmir woke up to blank editorials in various local newspapers. Also, for the first time in decades, both Urdu and English dailies refrained from publishing editorials, leaving blank spaces otherwise occupied by such pieces.